Welcome back to the weekly 4 Moms post, in which 4 moms with a collective total of 35 children share our knowledge, experience and and helpful tips in maintaining health, order and sanity. This week we’re offering up book recommendations for beginning readers. Early reading is an exciting time for little ones, and an equally exciting time for those of us teaching them. I love to see the spark as they begin to realize that they can do this! Bob Books are the ultimate in early readers. Even a child who doesn’t know the entire alphabet can experience the sense of accomplishment that comes from reading an entire book on her own. 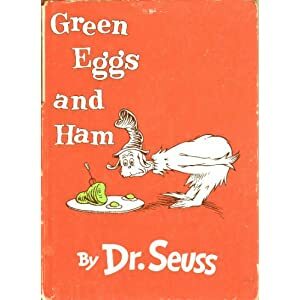 I’m not crazy about Dr. Seuss books in general because they are geared toward the look-say reading method, but there are some that are useful and undeniably appealing. Little Bear books by Elsie Minarik are popular, but they have never appealed to me or my young readers. The vocabulary is just too simple and stilted for my taste. Amelia Bedelia was in our list of books to read to little ones, but it’s also a wonderful early reader with lots of easy words and funny stories. Syd Hoff books have simple, charming illustrations and cute stories that are short enough even for a slow reader to finish in one sitting. We have Sammy the Seal and Thunder Hoof, but I know there are many more. Short, easy chapter books are handy to have around as beginning readers gain speed and confidence. I love to see them become more and more immersed in stories as they gain fluency. Frog and Toad – Cute, charming and funny. What more can you ask? We Both Read – A series in which all the left pages have a few lines of very simple text for the child to read, while all the right pages have longer and more complex vocabulary for the parent to read. We loved our 2 titles for years and were excited to discover that there are many more. Grandma’s Attic – Slightly more complex vocabulary, but chapters are hilarious stand-alone stories that make children want to take on the challenge. Billy and Blaze – A boy and his pony. Even girls love these stories. Those are favorites in our house. What are some of your favorite books, series and authors for beginning readers? Oh and to add to the above comments, I still had my Little House book set from when I was a child (started them at age 5) and I read “Little House in the Big Woods” to my 3 and 5 year old boys and they just loved it! I haven’t moved on because most of my books disinigrated once I started looking through them so now I have to replace the lot. I know they’ll enjoy Farmer Boy, but you know, it’s been 6 months since I read that one book to them and they *still* mention “the Laura book” or things “Laura did”! THANK YOU! I have been searching for books now that my 5 year old is reading. It’s been a very long time since my last early reader and I just couldn’t remember many books. We’ve been reading the Bible story books from Zondervan Kids (which are available on my Nook so it’s easier to tote around wherever we go). We liked the first two Little House books and our sons liked Farmer Boy(it’s set in New York and we’re Long Islanders.) keepersofthefaith.com has an interesting book review(the Ingalls were Masons,etc.) at their articles/book reviews. In one of the books Laura had trouble saying the marriage vows. We don’t like the tv series. 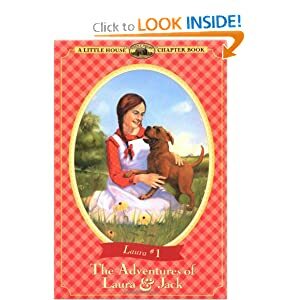 Ruth, For what it’s worth, I was never very fond of the Little House books when I was a girl, but my husband LOVED them as a boy, as did my little sister and her best friend (who was a boy). I’ve never thought of them as specifically gender specific. A big “amen” to all the books discussed so far. We also like the “A to Z mystery series” by Ron Roy. This is about a second-grade reading level. There’s one book for each letter of the alphabet, and we own them all. Really likeable characters and always a mystery to solve. ( A couple of them are kind of scary, if you have sensitive kids…just a heads up.) I’m loving the book posts! I’ve got two tabs open–one on your site and the other on the library website! If this little one is a girl, I’ll have to start looking for those Little House chapter books! I do think those books are more appealing to girls than boys, in general. Little ones in church….. We’re in the throes of working through this one with our 2- and 1-year-olds. We’re blessed to participate in a Sunday family fellowship in family homes, so it’s somewhat less formal than a more institutionalized church. This has allowed us to have some flexibility working through this issue with our little boys. Last Sunday, they made it through about an hour and a quarter comparatively quietly with just a couple of small toys to play with on our laps! Yay for progress! Can’t wait to hear your thoughts on this topic as well! Many blessings from our family to yours! Billy and Blaze books for sure! I like the Dr. Seuss books because you have to read each word carefully or you trip over your tongue. Good practice for sounding out carefully–Fox in Sox anyone? Mother Goose Nursery rhyme books are also a favorite. My kids like the Biscuit books. They are short and easy, with lots of repeated words, for quick success. They also love cats and dogs, so they’re a big hit around here! How could I forget Ramona? We have loved her forever! …Four Moms that is. My Achilles heel is unnecessary apostrophes.. I love most of your suggestions! Chicken Soup with Rice by Maurice Sendak (Oh my gosh, Kindergartners go crazy for this one! And it’s great for teaching the months of the year). And for early chapter books, my family absolutely adores The “Ramona” books by Beverly Cleary.